Asylum: The main map with all the features you'd expect in one of my WaW maps. Courtyard Survival: Survival map in the main courtyard area. Asylum Defense: The return of my streaks defense mode seen in Dawnville's Trench Defense. 1st Room Challenge: Survival in the first area. The pack includes Gun Game, Sharpshooter, and One in the Chamber modes. Backlot Revisited is an update to my 2014 release of Backlot Zombies. New areas, new features, new weapons, new modes, more detail and major optimization improvements. Complete arsenal of modern weapons. Gun game, Sharpshooter, One in the Chamber. And more to be found through playing. If you are having trouble running the map, try the Low Detail version of the map found here. Dawnville is a mini map pack for World at War Zombies. There are five maps included in the download. Dawnville: Return to WWII for a more classic World at War Zombies experience. The challenge system enjoyed by many players in SOG and Backlot returns with improvements. Complete the challenges to unlock more perks, then survive the end game to beat the map. Samantha will not go easy on you. You've been warned. Dawnville Low Detail: A low detail version of Dawnville for players on laptops or other lower end computers. Train Station Survival: Survival in the first room of Dawnville. Keep the windows boarded and don't let the zombies in. Aim for the head and kill them quick. Survive as long as you can. Trench Defense: Defend a small trench line against waves of the undead. Obtain perks and upgrades through kills and headshots. Survive as long as you can. Graveyard Shift: Your squad sets up in the church and prepares for a fight. You have limited guns and ammo. No magic. Survive as long as you can. Best played coop. Version 1.1 has been released adding Gun Game and some bug fixes. Wolf River ditches the magical elements from zombies (points, powerups, wall weapons, etc.) and brings a more realistic scavenge to survive gameplay style. Players progress through the level by completing challenges to open gates and doors. The level is designed to keep players on open paths, while zombies path through the woods to cut players off and keep things interesting. Before each game the host player can select a difficulty. There are three difficulties. Easy, normal, and hard. Each difficulty effects the zombie's health and spawn rate. Easy also reduces the grabbing effect World at War zombies have. Gear and ammo available in a game is based on the difficulty selected and the amount of players in the game. By limiting the amount of gear and ammo available to players, it adds a new level of thought and strategy to the good old zombies formula, making players think about how they want to handle each and every round. If you have trouble running the map, try downloading and installing this small optimization patch. A solo only, day time version of SOG. The map is set up to be a challenge map and test a player's ability to beat it. This gives the level a unique, challenging gameplay experience. The player spawns with only a machete and has to survive the waves of undead while completing challenges for rewards that progressively upgrade the player with new perks and weapons. One of my earlier and more well received maps, this map was a great learning experience and helped me find my passion in creating content for the game. Players complete a set of challenges located around the first area of the map. Once a challenge is completed, players are rewarded with a new perk and/or weapon. Once all of the challenges are complete, an end game sequence will unlock. The default Nazi zombie models were replaced with zombie models from Black Ops 2's Tranzit to fit the modern theme. Hellhound rounds were replaced by alien rounds to add another layer of uniqueness to the level. Ten Garden Gnomes were hidden around the level. When all ten were shot, all players would receive an upgraded minigun for some awesome zombie slaying action. Modern weapons from various sources were added to the level to fit the modern theme. While making SOG, I knew very little about optimization. If the map does not run very well for you, you can try installing the fog patch to increase your FPS. Patch 1.2 has been released and includes gun game, bug fixes and more. Patch 1.2 does not include the map itself and requires SOG 1.1 be installed first for it to work. Based on a very sarcastic conversation, I threw together this map very quickly. It is not meant to be taken seriously. 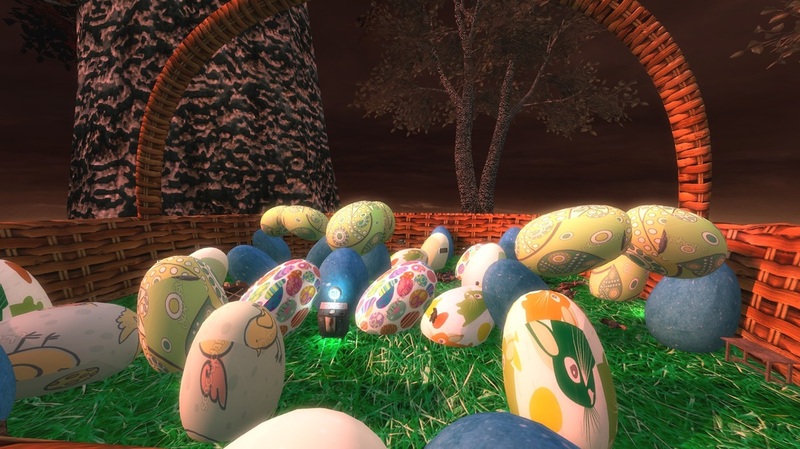 Take your zombie eggstermination to the eggstreme in this most eggcellent map!